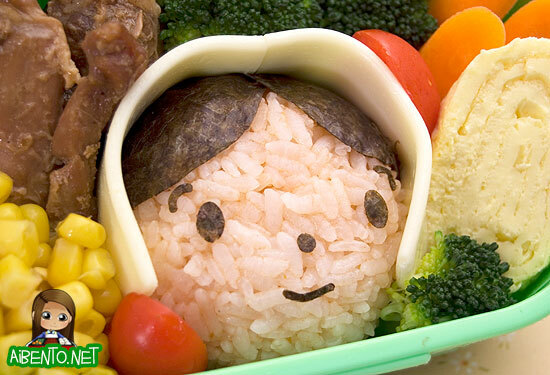 Today I have a little pilgrim onigiri in my lunch to start off a short week of Thanksgiving themed bento. I wish I’d had more time to make the chicken a bit more presentable, but I was in a hurry! I used my aunty’s special teriyaki sauce to make the chicken and was going to pitch her sale of it at a craft fair on December 12, but then I realized, I forgot to ask her which craft fair. LOL! I’ll get that info from her later! I started with the onigiri first, which is dyed “peach” with a small squirt of ketchup. Using ketchup to make this color is really good for onigiri because it gives the rice a bit of stickiness, which makes it easy to form. Just don’t use too much otherwise then it just starts to taste like ketchup. Here’s a close-up of the pilgrim. To make her hood, I simply used a slice of white cheese that was trimmed for length. It’s very important that all your foods be completely cooled, otherwise the cheese will simply melt. All I did was wrap it around her and that was that! The broccoli at the top helped to keep it in place while I filled in the other foods. Clockwise from the left I have corn, shoyu chicken, broccoli, baby carrot sitcks, tomato, and tamagoyaki. My tamagoyaki pan that I love so much apparently can’t work its magic with egg substitute. In fact, I’m finding that there isn’t a whole lot you can do with Kirkland’s new brand of egg substitute, including making scrambled eggs that taste good. So far every time I’ve cooked this crappy stuff, they come out looking and tasting crappy. I wish they’d bring back the brand they had before, but I guess that’s not happening. The tamagoyaki looks nasty, but the kids ate the leftovers, so hopefully it doesn’t taste that bad. Since Christmas is coming up soon, I thought I’d mention my Adventures in Bentomaking list of Bento Recommendations . 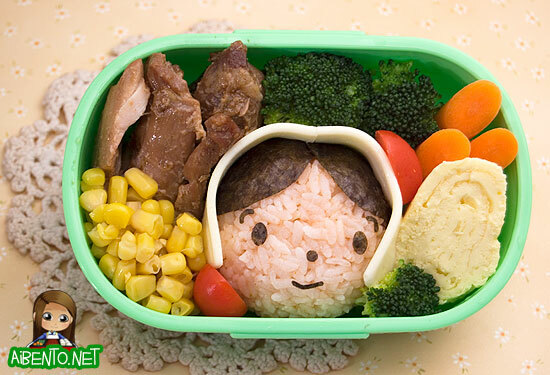 These are all either products I have or would like to have and therefore would make great gifts for a bento lover!